Topsoil, soil mixes, and compost for your landscape and garden. 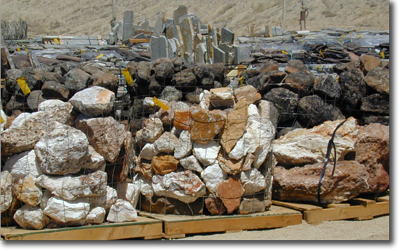 Decorative rock, signature stones and boulders for your pathways, borders and xeriscape. Structural fills and bases for everything else. We are the only permitted commercial composter in Washoe County, and our compost is made exclusively with material brought to us by local residents and businesses. We accept clean yard waste (tree trimmings, grass clippings, leaves etc.) for a small charge, and we would like to encourage you to consider us as an alternative to taking this material to the landfill. We do not currently offer delivery in-house, but we are happy to provide a list of haulers you can call for delivery. We take pride in providing customer service and quality products at a reasonable price. If you have any questions, please give us a call or click the link below. Pallets of rock for "do it yourselfes"
The homeowner, the do-it-yourselfer, is the core of our business and in these challenging times we believe that you can get greatest bang for your hard-earned bucks by combining our landscape materials with your labor and creativity.